Kalamazoo, MI November 6, 2017 – Each year, advanced student performers audition for the opportunity to take the stage as a soloist with the Kalamazoo Symphony Orchestra. The Kalamazoo Symphony Orchestra is honored to announce their 2017 Youth Soloist Competition Winner, violist, Sava Velkoff, and Runner Up, vocalist, Alex Smith, both students of Loy Norrix High School. Cellist, Lydia Schubkegel (Senior Home School), was also given Honorable Mention. Sava Velkoff was named the 2017 Youth Soloist Competition Winner after her amazing performance of Cecil Forsyth’s Viola Concerto in G minor. On December 16, she will take the stage at Chenery Auditorium, as a featured soloist in the symphony’s annual Sounds of the Season concert. Velkoff will be performing her winning piece. Baritone, Alex Smith, wowed judges at the competition with his performance of Mozart’s Die Zauberflöte, "Ein Mädchen oder Weibchen." He too will be featured in the KSO’s Sounds of the Season concert, leading the Kalamazoo Children’s Chorus and audience in a holiday sing-along. Sava Velkoff, 17, is a senior at Kalamazoo Loy Norrix High School and the Kalamazoo Area Math and Science Center. She began playing the viola at age nine with the KPS elementary school music program. 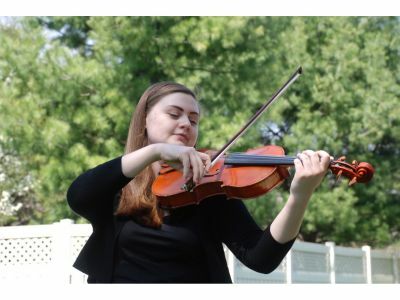 At age 13, Sava began studying with Violist Olga Ziabrikova at the Crescendo Academy of Music, and is currently studying with Professor Igor Fedotov at Western Michigan University. Sava has participated in master classes with prominent violists such as Paul Swantek, Gela Dubrova, Steven Tenenbom, Yizhak Schotten, and Roger Chase. Sava has participated in school orchestras, WMU’s SEMINAR, Blue Lake Fine Arts Camp, MSBOA’s Solo and Ensemble Festivals, Crescendo Academy of Music’s Ensemble program, and the Kalamazoo Junior Symphony Orchestra. Sava has performed with the Kent Philharmonic Orchestra and performed in the Casalmaggiore International Music Festival 2017. From a very young age, Alex Smith has enjoyed being able to tell stories through the songs he sings. His earliest singing experiences took place at church and subsequently in various choirs and at the Kalamazoo Civic Theatre, where he was cast in youth theatre productions beginning at the age of 9. He began private voice study in 2013 with Patrick Coyle, and currently studies with Dr. Kenneth Prewitt at Western Michigan University. Alex has been successful in a variety of competitions for young vocalists, and has been fortunate to study in many different settings. He was the First Prize winner in his division (High School Men) at the National Association of Teachers of Singing (NATS) Michigan Chapter Competition held at the University of Michigan in Fall 2016. Alex received an Honorable Mention in the Hal Leonard National Vocal Competition in February 2017 (High School Art Song), and was awarded First Prize in the High School Division of the Kalamazoo Bach Festival Young Vocalist Competition in March 2016. He was selected to study at the prestigious Curtis Institute of Music Young Artist Voice Program this past June. During the summer of 2016, Alex was invited to participate at the Oberlin College Vocal Academy for High School Students where he was a student of Salvatore Champagne. He has beneﬁtted greatly from the generous coaching of Meredith Arwardy-Kahrl. Alex is currently a member of the WMU Chorale, while dual enrolled at Western Michigan University, and was a student at SEMINAR (WMU) during the summers of 2014-16. Alex began cello studies at the age of three with Grace Field in Kalamazoo, MI. He attended the prestigious Interlochen Arts Camp at the age of eight, participating in the Junior String Orchestra and Choir Program. During the summers of 2010 - 2013, he attended the Chicago Suzuki Institute where he worked with some of the ﬁnest Suzuki cello teachers. In April of 2011, Alex had the honor of performing for Yo-Yo Ma as a member of the Grace Notes (an eight-piece cello ensemble), at a reception following Mr. Ma’s performance with the Kalamazoo Symphony Orchestra. As a member of the Grace Notes he also performed at the Stratford Summer Music Festival as well as the Royal Ontario Museum in Toronto, Ontario. The Grace Notes were featured performers at Kalamazoo New Year’s Fest 2010 - 2013. Alex has participated in Master Classes with Anthony Elliot, Amy Barston, Matt Haimovitz and Richard Aaron and currently studies with Bruce Uchimura. He has been a member of the Kalamazoo Junior Symphony Orchestra since 2012, and participated in the KJSO international tour to China in June 2014. Alex has been involved in numerous Kalamazoo Civic Theatre productions including lead roles in the musicals, “Beauty and the Beast Jr.” (2017), the world premiere of “Sherlock Holmes and the Mystery of the Crown Jewel” and “Anne of Green Gables” (2015), “The Magical Adventures of Merlin” (2014), and “How I Became a Pirate” (2012). He has also been cast in lead roles in productions at Loy Norrix High School where he is currently a senior. In his free time, Alex enjoys spending time with friends, doing volunteer work, listening to his extensive music collection ranging from opera to hip-hop, and creating and recording music. A KSO holiday tradition with a twist! Join us as we rediscover music from your favorite holiday movies: The Polar Express, Frozen, Elf, It’s a Wonderful Life and many more. Los Angeles based and internationally acclaimed Flutist, Sara Andon and Kalamazoo Children’s Chorus join the KSO. The evening will also feature the 2017 Youth Competition winners; violist, Sava Velkoff, and baritone, Alex Smith.